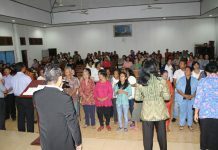 Praise God, it was amazing what God had done for Biak, Papua. KPPI was held on November 28th-29th, 2009 at Putra Angkasa Biak Field. At about 6.30 PM (Eastern Indonesian Time) the souls began to arrive. They came with all sicknesses, seen a woman who held her sick son, there was also a man who brought his son. Seeing those souls, they were like stranded, like no one who grazed them. They really needed the teaching of God’s Word, so that the truth set them free, and led them to turn from their sins and come to the Lord. The Word of God delivered by Rev. Jacob B. Sumbayak concerning the Lord Jesus who called His disciples to become fishers of men. Rev. 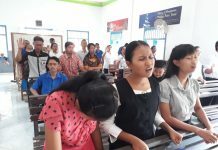 Jacob B. Sumbayak said “Just as the Lord Jesus called His disciples to become fishers of men, God wants us to become fishers of men too, to bring the souls of Biak to God. God loves us, will we become fishers of men for Him, will we be a blessing for Biak?”. After the Word was delivered, God’s servant summoned those who would become God’s servants to come forward. Many young people came forward, more than 200 people. With tears and hearts touched, they surrendered themselves and said they wanted to be God’s servants. Then, everyone who wanted to believe in the Lord Jesus, was inviting to stand up and pray to invite Jesus into the heart and become God and Savior. 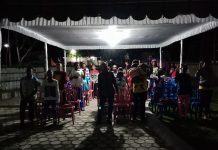 Many people stood up, Praise the Lord the salvation occurred over Biak. Afterwards, it was the time for healing prayer, where God’s servants and HMC disciples stepped forward first, then followed by the sick. Before praying together, Rev. Susan Sumbayak called anyone who suffered from breast cancer first. A woman was prayed, and Praise God, she was cured, the pain was gone instantly. Joy emanated from her face, and tears flew as she was touched by God’s goodness. God’s servants and counselors started to pray for sick souls earnestly. And miracles after miracles began happening. On the stage, started being witnessed healing which took place. There was a woman who had pain in the nose, could not smell anything, it had been for two years. Incredibly, that evening she was able to smell the eucalyptus oil. Likewise a man, who came with a jaw pain, as a result of an accident and beaten by someone, his jawbone shifted, and his hand was broken. While he was being prayed by Rev. Susan Sumbayak, he fell, and immediately his jawbone and hand returned to normal. What amazing things God did and they were unthinkable to us. Other diseases which God healed include breast cancer, lump, stroke, waist pain, finger cramp and could not be straightened out, knee and spine pain, broken bone, arms and legs that were difficult to be moved, deaf, kidney stone, heart disease, bleeding, appendicitis, gastric swelling, diabetes, ulcer, epilepsy, high blood pressure, chest pain and tightness, abdominal pain, headache, eye injury, cough, nose pain could not smell, and more other diseases were cured. Praise the Lord, closing this year, God was doing great things at KPPI crusade. Glory to God, who has accompanied us with all His might and miracles! What is unthinkable, that is what He does for us who want to be His instrument.